This Tibia multiclient allows you to open several Tibia clients. This tool includes source code so you can see that it is safe. It works in all recent versions of Tibia, up to tibia 11.11. This Tibia multiclient 11.11 does not need to modify Tibia.exe at all! So it should not be detectable. It should be 100% safe now. After that just press the main big button to launch Tibia in multiclient mode. It should open a new Tibia multiclient each time you press that button. 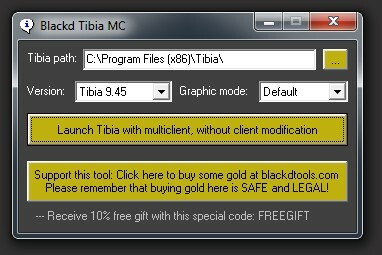 The current menu of this multiclient allows you to load mc of several Tibia versions, from any path, and it also allows to run Tibia in any graphic mode. To download New Tibia Multiclient, browse to the free tools page or click here.